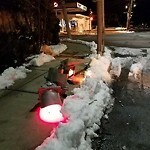 Signal problem: Traffic | Type of problem: Other | Type of pole: Vertical Pole | Pole knockdown: Yes | Details: BPD reporting traffic signal pole knocked down and laying in the island. Notified Dagle 1:18 AM. Signal problem: Pedestrian Signal | Type of problem: Pedestrian Indicator Not Working | Details: Walk signal to cross Tremont St is not coming up when Avery St has a green. It continues to display Don't Walk.